Your trading computer holds your most valuable business assets. These include trading software, notes, market research, and more. So you need to protect your computer against disaster. Regular backups of your computer are a must. However, you need to periodically evaluate if your backup plan still makes sense given the current state of technology. A few years ago, the personal computer space was different. Backups were harder to organize. With reliable internet and cloud storage services, it has gotten easier to back up your system at lower cost. Figure out what is important on your trading computer. It should be mostly data. Word documents, spreadsheets, and notes that are important to you as a trader should get first priority. Make sure you have a system to organize your folders, so you know where your important data resides. Most users use cloud storage for their photos and music files. But if you have local files, back them up, too. High speed and availability of the internet has changed the software installation process. Today you don’t have to worry about losing your software CDs. Most of your software is always available on the internet. 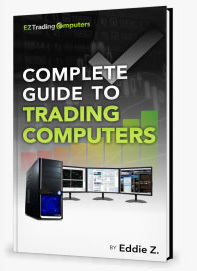 You should take an inventory of all the software you are using on your trading system. Productivity tools like Google G-Suite and Evernote are already cloud-based. Other tools like anti-virus or PDF readers are easily downloadable. So there’s no need to back them up. However, you might have specialized swing trading or day trading software that needs regular backups. Depending on the software, you might need full or partial backups. Check the user’s guide to find out the optimal method. In the past, you needed a full-system backup for your operating system. But today you can use a tool like Microsoft’s media-creation tool to create a one-time copy of your OS. You can save the backup to a flash drive for easy access during disaster recovery. Depending on your situation, you might be tempted to go for a full-system backup. But full-system backups are costly and time-consuming. Today’s operating systems and software have large footprints. So you will need a lot of space to store these backups. Even TBs of external hard drives can get filled. Additionally, a full-system backup takes a long time. It can slow down your system. Also, if there is a virus attack or registry corruption, it can propagate the problem. And then restoring your system has its own problems. Full-system restoration is volatile. Restoration issues can take more time to resolve than doing a fresh installation. So for all these reasons, full-system backups may not be the best solution for you. For most people, cloud computing plays a vital role in their backup strategy. Cloud services like Dropbox, Google Drive, OneDrive, Apple Cloud, and others are convenient and reliable. So it makes sense to use these services for data backup. Cloud services continuously or regularly sync your latest data. But this means ransomware and malware get synced to the cloud, too. Plus, if you overwrite something and then want the old version back, you’re out of luck. So here are two options for protecting your backups from malware or mistakes. Use them in addition to cloud backups. Store a copy of your data (and only data) on a local external drive. You can do the local backups manually and less frequently. If the cloud information gets infected, the external drive backups will work as an insurance policy. Sign up for one of the independent backup services, such as Backblaze or Carbonite. Just set a regular schedule for backing up (perhaps once or twice a day) and let the service do the work. Safeguarding the integrity of your trading data is integral to your business success. Make sure a robust backup plan is part of your business strategy. Schedule some time today to review your plan.